The floor material are "Interlocking Tiles" (IT's) - about 14" square. The interlocking feature is hidden and seams are straight. They are made of a rubberized material - very durable so far. Installed last summer, we've had about 6 weeks of usage. We carry a small Honda Trail 90 scooter in the living room area and they show no signs of wear/tear. Easy to clean and keep nice looking. Vapor barrier is made of small Styrofoam (7 shot size) sandwiched between a layer of red plastic film. I waterproofed the subfloor with a shower pan waterproofing material (goes on "pink" and dries "red")... Subfloor to wall seam was sealed with a heavy duty silicone caulk. If liquid spills on the ITs its just a quick wipe-up and you're done. If it spills and stays unattended (which happened once so far) - I just un-snapped the affected tiles and wiped up the liquid from the vapor barrier. Bought all the materials from in-stock items at Lowe's... FYI. We repaired dry-rotted original subfloor last summer. From the pix below you can see the silver insulation material I connected to the under side of the marine plywood replacement subfloor. The new subfloor pieces were waterproofed top/bottom and edges. Basement insulation was removed and replaced with new. You can see the red vapor barrier over the waterproofed subfloor in one of the pics. Looks great! I like the foil wrap under the subfloor. I'll have to check out Lowes for those tiles. We have a german shepherd and a lab mix. We have a 5 year old GSD. I've been wondering what it would be like living with him in an AS environment. Seeing as how you also have a lab mix, I'm guessing it's doable!! I love your water & food bowl drawers. Very nice. 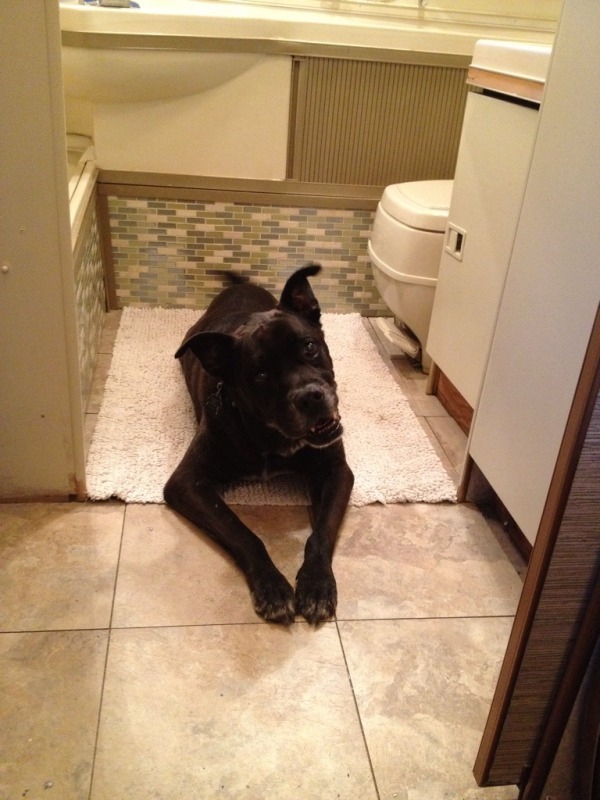 Thank you and it is very much doable... our lab/boxer mix likes to call the bathroom his, while the shepherd... well, he just calls the entire trailer his, and somehow always ends up in our way. He prefers to be outside, as do we, but tolerates coming in for the night. 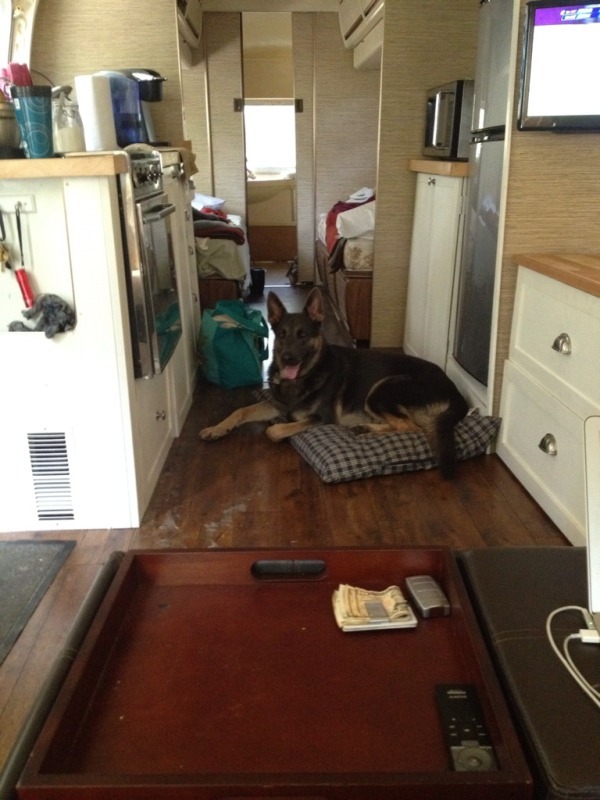 In the picture below he picked up his bed and moved it to the most inconvenient place in the trailer, set it down and plopped right down blocking any easy passage. We've been camping with my wife, myself and my 18yo daughter with the two dogs and have had no problems to speak of. Keep in mind we came from a pop up though, ha. Wow... never thought this could be such an issue. We have two Australian Shepherds. We just put their bowl on the floor. They generally don't spill a drop. The only problem is when they run out of water and play "bowl hockey" to let us know it's time for a refill. ...with whatever pet-waterbowl configuration used, be sure to add an additional step to your "Back-on-the-Road Again" checklist - something like, "...empty fido's water bowl before moving." We took the winter floor mats from the truck and use one for the dog bowel and the other in the bed of the tuck to put the two Honda generators on for boondocking. Both work pretty well. Our lab is a drinking slob, so I've trained her to stand over the bowel for a short while after drinking to let the dribble go in the bowel. Works most of the time. Our akita is a VERY sloppy drinker, the corgi not so much. We keep their water bowl under the dinette in a plastic boot tray and it works well. Amazon.com: Yaktrax Boot Tray: Sports & Outdoors. We just put our sloppy drinker's bowl outside, but I need to train her to drain her dripping jowls over her bowl like Paiceman did! I love that! I'm only 2 weeks into the new Airstream Adventure, so trying to figure this all out too! I have an Interstate, so, having a bit of space envy of y'alls trailers with so much room. Me, husband, a 50# dog and a 44# dog...it's tight. We've been putting the water bowl on a little ledge that's behind the second row seat on the passenger side. Bought a collapsible rubber bowl that fits perfectly! And when we drive, we put it in the sink. My pups have beards, so they're a bit drippy when they drink, but nothing a paper towel can't wipe up. After kicking it over a hundred times in front of the sink, my husband moved her water dish to the inside corner if the door (we have a Bambi) next to the cabinet. I put it in the sink when we travel. I keep the dog bed under the table!